A bull moose that recently dropped its antlers for the season feeds in the lower Ponderosa area in Spokane Valley on Jan. 19, 2009. It’s the shedding season for the area’s deer, elk and moose. Even the biggest bucks and bulls have been getting rid of their head-gear and looking a lot like the girls. They’re shedding their antlers to make room for new and maybe larger racks by next fall to help gauge their breeding prowess. Antler shedding doesn’t happen all at once. In early December, Hal Meenach, a landowner south of Spokane, reported seeing the first buck of the season shedding antlers for the winter. The buck had lost only the antler on one side of his head to stand out as a lopsided sign of the season that runs well into March. Hiking in the Snake River breaks in the first week of January, I found two antlers side by side where a large whitetail buck apparently bowed and dropped them off simultaneously. A week later, hiking in Riverside State Park, I saw two mule deer still proudly wearing their large hat-racks. 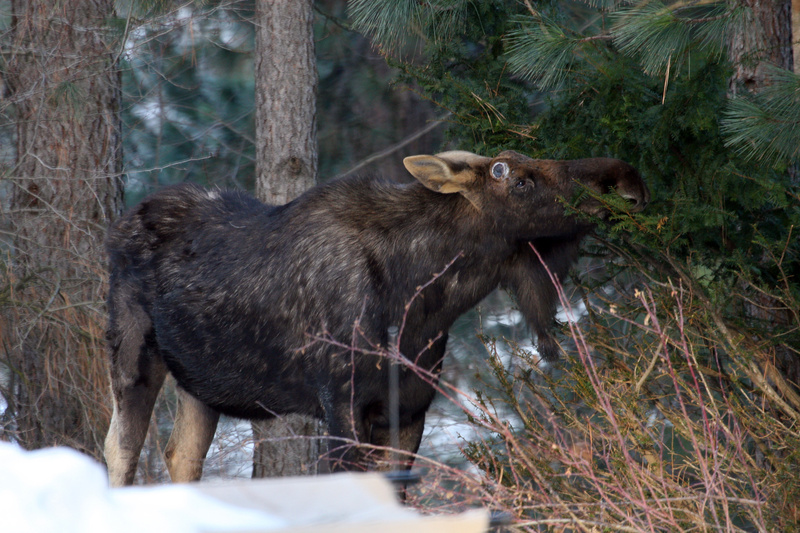 Hans Krauss once sent me a photo of a moose that had just dropped his antlers near his Spokane Valley home on Jan. 18. Antler shedding figures in to Washington Fish and Wildlife Department winter big-game surveys. “We time the survey in early January because we know that by Jan. 15 there’s a high probability that some bulls will have lost both antlers and be hard to distinguish from cows from the air,” said biologist Howard Ferguson. Antlers are temporary projections of bone grown and shed each year. New growth will start in March or April as increased daylight triggers testosterone production. Wildlife biologists say antlers are the fastest-growing tissue in any mammal. Deer or elk antlers can grow an inch a day. A big Alaska bull moose can grow an 80-pound rack in a summer, adding a pound of bone a day during peak growth. Some states have enacted laws prohibiting shed-antler gathering on designated big-game winter ranges. Fowler said he’d like to see a law considered for Washington, too.